I am so excited to share this Harry Potter birthday party with you as part of the be a part of the RaeGunRamblings for a Harry Potter Celebration, I have been wanting to share this party for some time and this has finally given me the gumption to get it done. Don’t forget to check out all of the other Harry Potter posts and enter the giveaway at the end of this post! 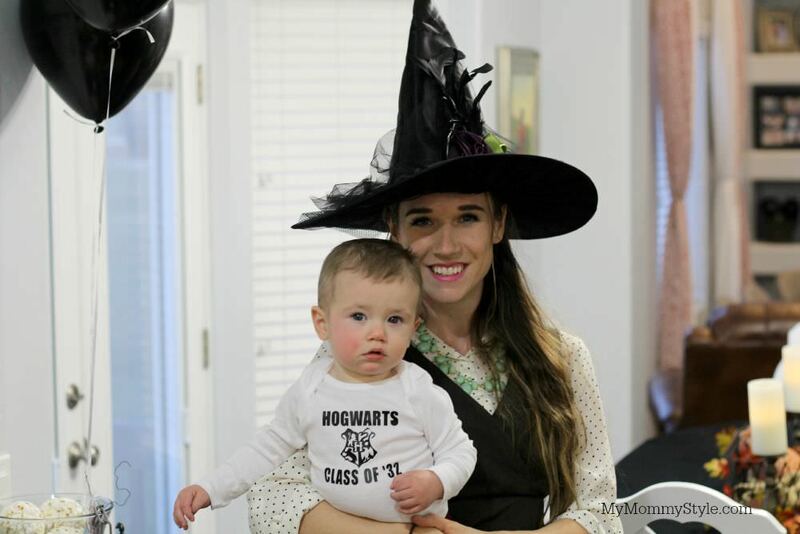 I am a self proclaimed Harry Potter fanatic and decided that I would throw a Harry Potter birthday party for my son when he turned one! A baby cannot tell you what theme they would like for their first birthday so I made it a party I would love and I knew my whole family would love too! This approach to a Harry Potter party involves your guests in a very intimate way and is to this day is one that my family still talks about as one that they absolutely loved. If you’re looking for recipes or game ideas for Harry Potter parties you can check out this post in which I partnered with Ruby and Roo, a party company in London that throws children’s parties. This does take a little extra effort on your part as the host to decide which family would be a good fit for all of the different characters within the book and you may want to give each guest an easy costume description and character description that they will be playing at the party. I asked some of my family members if they had a preferences and even called in a special favor for them to play different parts through the night. I am lucky in the fact that my family is able and willing to be silly and take part in playing along. It made the whole birthday experience so much fun for the children and adults! I didn’t really assign all of the little ones, they all just dressed up as “Hogwarts Students” but I did link to a bunch of characters below so you could use them as ideas for your own family and friends. By assigning the guests with a character they already came in the mood of the party and there was an instant excitement in the air, it created such a fun mood. I wanted to set the mood and try to re-create the Harry Potter experience as much as possible. I dimmed the lights, had candles lit, and played Harry Potter theme music. I even talked in an English accent, you don’t have to go this far, but I thought it was a lot of fun. The kids were so excited to go through the process of being admitted to the school. Our first step was Ollivanders so that they could have their own wands. If you want a tutorial of how to make your own go HERE. Again, my family took on these roles brilliantly well. I did not have an official sorting hat, but just found one in the clearance section after Halloween and used it instead. My father and my brother sang songs and said silly things as if they were the sorting hat and the kids thought it was hilarious. You don’t have to have the official hat to have a good time! Our next stop was a lesson with Fred and George Weasley. My nieces practiced saying things at the same time and showed the little ones how to bounce the balloons on their wands to make them float while saying “lingardium leviosa” we had kids come up a few at a time so that things didn’t get too crazy. The kids had a BALL levitating their balloons and would help each other say the spell together. All you need to make this happen is some black balloons, your wands, and you are good to go! I had asked my nieces to put together a little prank to pull and they surprised us with SILLY STRING! We all had a good laugh and it made the adults have even more fun. I will admit, we never got around to making the slime, but I did send them home with all of the things they would need to make it on their own. I also created “poison” that was hand soap that I had found in the Halloween clearance. Putting together this treat table was a blast. We had chocolate wands (chocolate licorice), chocolate covered pretzels, bertie botts every flavor beans, chocolate frogs, popcorn balls, and Dementors Kiss (chocolate kisses). For decorating the table you can use Harry Potter scarves, creepy cloth, chains, mice, pumpkins, crows, Harry Potter books, and Harry Potter ties. I had a lot of these items on hand as they were just items in my Halloween decorations, but you can easily find them on Amazon or local store. If you know you’re going to throw a Harry Potter party shop the Halloween clearance! You can find this baby costume from RaeGunsRamblings! I used this for his birthday outfit and his Halloween costume. If you want to learn how to make a robe out of a t-shirt that would fit a baby you can find my tutorial here. You can find this free Harry Potter printables I used from Pieces by Polly! I just love Harry Potter! I love that all through out my childhood there was always a show coming out or a new book coming out! I grew up with Harry Potter and I hope my son can do the same!